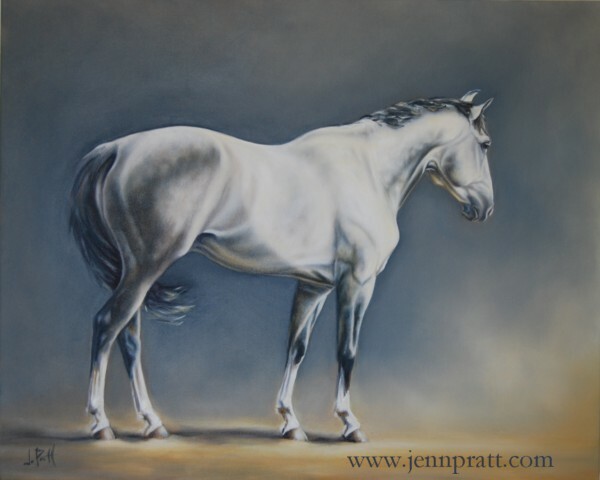 Beaudelaire | Jennifer Pratt Equine Artist. At long last I can share with you all, my rendition of ” Beaudelaire”. This painting was one of two paintings included in the February issue of Canada’s Style at Home Magazine; Small Spaces feature of Editor Erin McLaughlin’s home. The painting came back to me after the home shoot for final touches and I’m happy to finally call him done. Beau is an Oldenburg-cross gelding, owned by Erin. If you didn’t get a chance to see the magazine, please click HERE to review. What a great way to start off 2010! Beautiful painting, Jen! You have mastered oils in record time! oh geez Karen, I wouldn’t go that far to say ‘mastered’! but I will gladly take the complement! thank you! You have some beautiful work and a lot of talent. I look forward to seeing more of your work! thank you everyone!!! more coming up!! ” Beaudelaire” is a beautiful painting! You have done an excellent job of depicting the muscles and bone structure of the horse – that is a talent. I love the mood of the painting and its muted mystical feel.